I've arrived at a wonderful place. That is, I've written so many Joy o' Kanji essays that they are starting to overlap thematically. This could be confusing, I suppose, because just when I have it in my head that one kanji means X, I discover that another character represents something quite similar. However, that's not a new idea. After all, kanji study often involves knowing which characters are interchangeable and when. Mostly, I feel excited that some essays have related content. It's as if I'm assembling a 2,136-piece jigsaw puzzle and have found two pieces that lock together with a satisfying snap. That leads me to think that I'm making a dent in the nearly infinite task I've set for myself. As you can see from their definitions, these kanji are certainly distinct. As I wrote each essay, I rarely encountered the other two kanji. However, they can all refer to physical depressions, pits, hollows, and, yes, dents. It suddenly seems to me that hollows and depressions are everywhere. When I take trails through the woods and pass through urban areas, I spot hollows in trees and large pits in boulders. Last week I lost control on a Southern California beach, taking photo after photo of rocks with perfect divots. Seeing this theme all around me has spurred me to review the two older essays (1156 and 1987) to see where they overlap and diverge with 1032. I've now had a look-see and have pulled out some of the most salient points of intersection. The bottom part of 虚 originally represented “hill with a hollow crown,” such as an extinct volcano, says Henshall. Even now, he notes, 虚 can mean “hollow” in the sense of Sleepy Hollow or “dip in the ground.” Mostly, though, people use 虚 to refer to hollow words or hollow promises. That is, it primarily conveys falseness and dishonesty. Who would have thought, then, that 虚 would be the key kanji for expressing "hollow in a tree"? Three kanji clearly have overlapping meanings: 洞, 虚, and 空. All three can mean “hollow; cavity; hole.” All three convey that something is missing or empty. Furthermore, 虚 and 空 share the kun-yomi of むなしい (empty, void; vain, futile; dead, lifeless). When 洞 means “hollow,” by contrast, there’s nothing as complex as that. There’s no fraud, no ripoff. It doesn’t represent anything more than, say, the hollow of an old tree. As long as I'm doing a round-up, I'll mention that essay 1467 on 杉 (cedar) has a bit about a hole in a tree. It's located at a shrine in Nikko (Tochigi Prefecture on Honshu), and if you make a wish while facing the hollow in that tree, your wish will supposedly come true. I took my Thanksgiving guests for a walk along my favorite trail in the woods. They enjoyed talking to each other through an enormous tunnel-like hollow in a tree. On an adjoining trail someone has fancifully decorated another hollow in a tree. 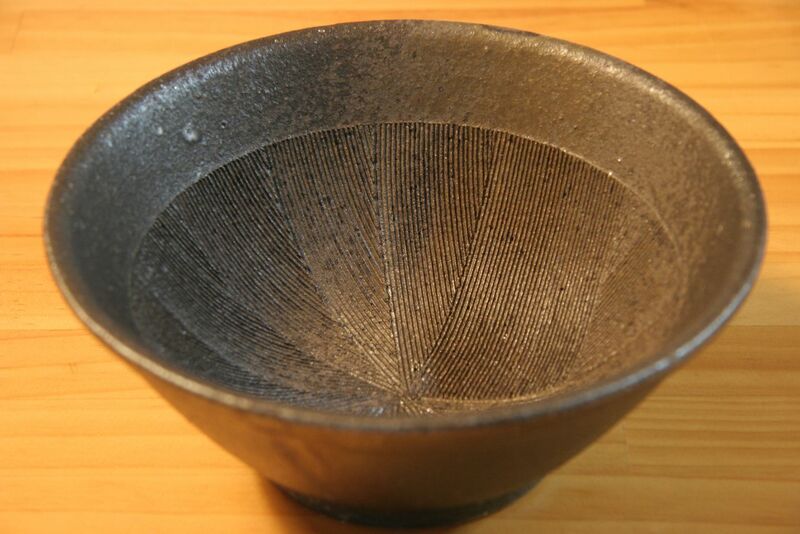 To understand this, you need to know that a スリバチ (すり鉢) is a small earthenware mortar that usually takes the form of a bowl. Its largely unglazed interior has grooves that provide a cutting surface. The Japanese imported the suribachi from China in about 1000 CE, initially using it to crush herbs for medicine and now using it to crush sesame seeds and the like when preparing food. What an ingenious leap to compare Tokyo’s up-and-down topography to the interior of this kind of grooved bowl! A boulder in my neighborhood. Musing about how 臼 came to represent “socket,” I commented to my proofreader that perhaps it’s because there can be grinding inside a joint. He thought that was possible but provided a more obvious explanation; 臼, he said, can represent things with a U-shaped depression, including a socket. A U-shaped depression?! Well, that's what 凹 is about from the get-go! I mean, it's a pictograph of concavity! The difference is that it's typical for 凹 to mean "U-shaped depression" and rare for 臼 to do so. I wrote there that “mortar” in English can mean both "bowl for grinding with a pestle" and "stocky cannon," among other things. As it happens, 臼 can represent each of these definitions. That's no coincidence. It came about because both a bowl and a cannon are receptacles of a sort; that is, they have U-shaped depressions. That just never stops seeming cool to me! I'm not sure what grand conclusions to draw from all this pattern matching. Perhaps there are no big, bold statements to make. The point of it all—of this particular discussion and of kanji immersion in general—is to bounce from one thrilling discovery to another, simply because the aha moments make life so much richer.